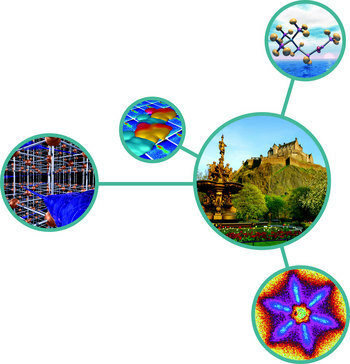 The next International Conference on Neutron Scattering will take place in Edinburgh, the capital city of Scotland, at the Edinburgh International Conference Centre, from 8 - 12 July 2013. The handbook with more information on getting to the conference and what to do once you are there is now available to download. To do so please click here. ICNS2013 will be the latest in the well established series of these conferences. 22 years ago, ICNS91 was held in Oxford, following ICNS88 in Paris and ICNS85 in Santa Fe. At that time, ICNS meetings were associated with the International Conference on Magnetism, and followed a three year cycle. So ICNS91 in Oxford was held the week before ICM91 in Edinburgh. Similarly, ICNS88 in Grenoble and ICNS85 in Santa Fe were associated with ICM88 in Paris and ICM85 in San Francisco, respectively. An earlier Yamada conference on Neutron Scattering took place in Hakone in 1982 as a satellite meeting of ICM82 in Kyoto. In 1994 the direct link between ICNS and ICM was broken, reflecting the expansion of the neutron scattering community beyond magnetism, and ICNS94 was held in Sendai, whilst ICM94 took place in Warsaw. Following ICNS97 in Toronto, it was decided that ICNS should run on a 4 year cycle, cycling through locations in America, Europe and the Asia-Oceania regions. ICNS2001, ICNS2005 and ICNS2009 were held, respectively, in Munich, Sydney and Knoxville. Edinburgh, capital city of Scotland, is an experienced conference location. A city of 450,000, it has a stunning historical setting, with Edinburgh Castle at the heart of the Old Town. Its vibrant cultural life includes 4 Universities and 5 national art galleries and supports the world famous Edinburgh International Arts Festival. The compact city centre makes hotel accommodation, conference venues and the social programme easily accessible by delegates. The beauty and drama of the Scottish Highlands and Islands, as well as lochs, Castles and whisky distilleries, are all within a few hours drive, and ideal for post-conference excursions. The purpose built Edinburgh International Conference Centre (EICC), situated in the city centre, is the ideal venue for ICNS 2013. The main Pentland auditorium seats 1200 in tiered theatre style, and can be transformed at the touch of a button into 3 separate auditoria seating 600, 300 and 300 delegates. Each seat has built-in writing tables to offer the practicality of a personal work space. There are a further 4 suites that can be subdivided to create 11 fully sound-proofed rooms, for additional parallel sessions, meeting rooms, organisers' offices etc.